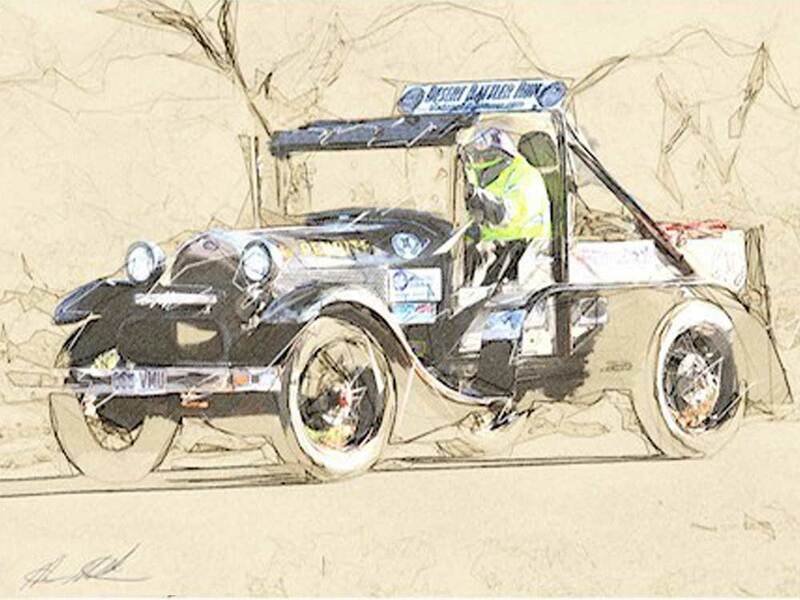 Vintage Adventurer Rod Wade has added another accolade to his growing World Record collection – for driving a pre-war conventional rear wheel drive car across Australia from the furthest point west – Steep Point – in Western Australia to the furthest point east – Byron Bay Lighthouse – in New South Wales. Rod drove a 1929 Model ‘A’ Ford across Australia via five of the harshest and sandy deserts in the land and never got bogged once! He first reached the Great Victoria Desert before heading to Gibson Desert, onto the Great Sandy Desert and Simpson Desert with its 1,143 Sand Hills, before finally crossing Sturt Stony Desert. The Model A ran a standard engine gearbox and differential with a 30% underdrive box in the drive line. For the sand Rod ran 16” x 10” BF Goodrich tyres front and rear and for the black the standard 21” Model ‘A’ tyres 4.50” x 21”. The engine had a high compression head from Snyder’s Antique Auto Parts from New Springfield USA and Rod used a normal composite red line head gasket and the performance was brilliant. The engine in the Rattler was the same one that Rod used to set a World Record, East to West across the USA in 50hrs 20mins 6secs. He changed the spark plugs, oil, oil filter and fitted that wonderful cylinder head. This was the most difficult of all Rod’s adventures, even more difficult than the worst of the Peking to Paris Rally’s Mongolia section. Rod added: “Negotiating 1,143 sand hills through the Simpson Desert and then up Big Red (four times) and into Birdsville was just as punishing as the road from Warburton to Uluru (Eyres Rock). I’d driven this road in 1984 and the Docker River section with its millions of high corrugates just about rattled the Landcruiser to pieces back then and this time was no different, there just seemed to be millions more corrugates just for me! Rod drove every millimetre of the crossing himself. There were support vehicles with crews but they found it difficult to the extreme even with modern vehicles. Rod spent around 20-25hrs in total waiting at the roadside for the support vehicles to catch up. For Rod this was a great achievement in his home country and he has said there will be more next year with the same Rattler!! Meantime Rod is building another 1930 Model ‘A’ Ford which he will be driving in the Peking to Paris 2016. This will be Rod’s second P2P and in 2016 his navigator will be Austen Ritchie, his co-driver in the successful Ocean to Ocean World Record across Australia and back in 101 hours. The duo are hoping for a top 10 result but will be more than happy just to get to finish.